The Bar M Loop is in the Moab Brands Mountain Biking Area north of Moab, Utah. The trail makes a big loop by following a series of old 4-wheel drive roads. 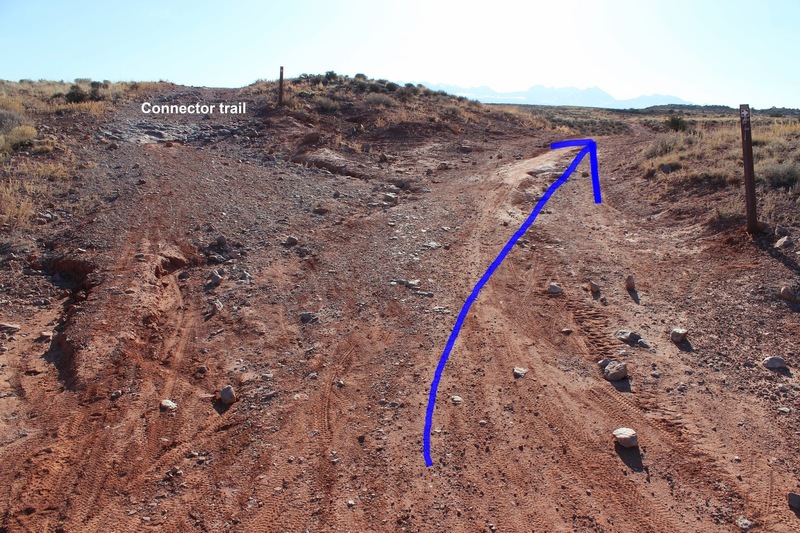 It is hard to ride any of the other Moab Brands trails without making use of at least some portion of the Bar M trail as a utility route to get to and from where you are going. With very few hills most of the trail is easy riding and only gets its moderate rating because of the overall length. Our total distance is a little more than what many of the maps show for the Bar M trail due to the fact that we rode all of the short connector trails so they would show up on our map. To get to the Moab Brands trailhead from Moab drive about 8 or 9 miles north of town on Highway 191 and turn right at the Moab Brands sign. The turnoff is right across the highway from the Gemini Bridges staging area and just before the Highway 313 turnoff to Dead Horse Point and Canyonlands National Park. Follow the double track east from the trailhead for about 6 tenths of a mile and you will come to the Bar M Loop. Enroute you will have passed the turn offs for the EZ/Lazy trails, the North 40 trail and the Copper Ridge Road. We rode the loop in the counterclockwise direction for no other reason than we thought it would be as good as any. At the 0.87 mile point a connecting trail for the North 40 Loop departs on the left and the Circle O trail departs on the right. As the trail begins looping around to the west there is a cliff option where you can peer down into Courthouse Wash. Some maps also consider this an extension of Seven Mile Canyon which Highway 313 passes through on its way to Dead Horse Point and the Island in the Sky District of Canyonlands National Park. If you follow the canyon downstream you will end up in Arches National Park and eventually at the Colorado River in Moab. At 2.35 miles the trail passes through a gate and shortly after the Zephyr trail branches off on the right. The Zephyr trail stretches from here for 4 miles to the Klonzo Mountain Biking Area. After passing the turnoff for the Zephyr trail the Bar M continues looping west below the North 40 trail. As the trail turns toward the south it passes through another gate at about the 2.7 mile point. Most of the next 2.5 miles of the Bar M is a graveled road that parallels Highway 191. After the trail crosses the road leading to the Moab Brands trailhead it travels side by side with the Moab Canyon paved path. At the south trailhead the Bar M makes a 90 degree left turn and heads east. After the south trailhead the Bar M passes the EZ trail at 5.26 miles, the Lazy and Deadman's Ridge trails at 5.5 miles, the Copper Ridge Road, and then at 5.7 miles it comes to a fork where it continues along the right branch. The left branch of the fork is a short connector that pops over the hill where it rejoins the Bar M trail as it heads north along its final leg of the loop. At its southernmost point the Bar M comes to a busy intersection where the Bar B Loop and the Rockin A trails begin. There is also a sign here that points out the direction to the Circle O trail which is still almost 2 miles away so the sign seems a little out of place. The last leg of the loop is back on the same double track that it began with. It tends to be a little downhill and it is easy to make quick work of it. Rather than head back to the trailhead we jumped on the Circle O trail at this point. The Bar M Loop was our first trail of the day. After completing it we rode the Circle O, Rockin A, Bar B, Lazy, North 40, Maverick and EZ trails in that order. We were the first ones at the trailhead that morning and nearly the last ones to leave at the end of the day. The Bar M Loop is a good ride when you aren't in the mood for bouncing over rocky trails or doing a lot of hills. If you would like to see it for yourself then all you have to do is grab your bike or 'Take a hike'.